Hypno (BKP 51) had a two short windows of mild popularity with the Pokemon deck building community. The first was to combine it with Darkrai EX and the stadium All Night Party. The second was pairing it with Snorlax from Fates Collide. Neither was particularly effective. The problem with the first deck was that your opponent could also benefit from All Night Party, healing its sleeping pokemon and striking back against your attacker. The latter deck was dependent on the one combination and fell apart if any element was lacking. Both decks were too reliant on Hypno, so shutting it down with ability suppression or targeting it with Lysandre/Guzma/etc. debilitated the deck. Although the popularity of Hypno has declined since, I don’t think this card deserves the abandonment the community has given it. I’ve gotten some good use out of the guy with this nifty deck. The focal point of the deck is (wait for it) Hypno’s ability (Goodnight, Babies) combined with Darkrai’s second attack (Dark Head) along with a third attribute of either the stadium Chaos Tower or Zoroark’s ability (Stand In). Now before you call the sanitarium and have me fitted for a straight jacket for trying to make a focal point out of 3 complex elements, the deck is actually much more versatile than the focal point makes it out to be. The key to this deck isn’t just the focal point, which works much smoother than you’d imagine from reading it in print, but the numerous and varied ways you can attack your opponent. Ok first, “Goodnight, Babies” is a powerful ability which will disrupt your opponent’s plans. In a normal pokemon game you have a good idea what your opponent’s attack will do and can make plans for your own counter strike. However when there’s a 50-50 chance your pokemon will be sleeping, those plans can’t be relied upon. So you get a good idea about the disruptive nature of Hypno. Additionally Hypno’s ability cuts down your opponent’s capability to attack by half, although in actuality that number is reduced due to them playing cards to remedy the situation. Even still that kind of “remedy” benefits you, since they are likely to play cards that they’d rather not that turn. More often than not they’re wasting cards that they don’t necessarily want to play at that time. In short, Hypno’s ability (Goodnight, Babies) is a painful force on it’s own. However without any firepower, it’s worthless. That’s where Darkrai’s Dark Head attack comes in. For ( ) it does 160 damage to a sleeping pokemon, and a choice band puts it in OHKO range for a high percentage of pokemon. Even if you’re dealing with a pokemon that will need two attacks, the 50% chance of sleep makes this more easily achieved. Meanwhile Chaos Tower offers a marked improvement over All Night Party, as it only benefits your pokemon and also provides protection against paralysis as well. Adding both Zoroarks provides an additional boost, both with abilities and attacking. 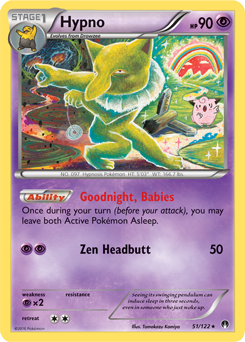 The GX version allows you to draw 2 cards (Trade), while junior’s ability (Stand In) provides another way to negate Hypno’s sleep effect on your own pokemon. As for attacks, both usually hits for somewhere between 100 and 150 points of damage. For an added bonus, I threw in a single Zoroark BREAK, so either pokemon has the potential to mirror opponent’s attacks. As for results, this deck plays well. Right now I’m a solid 11-5 at PTCGO with this version, and it has taken down a few big decks. For instance, the most recent game I played was against Metagross GX. In the match, I took down the first GXs, because my opponent was relying on the ability to retreat & heal which he couldn’t do because he failed the coin flip from sleep. Later in the match I used Zoroark to steal Kartana GX’s Blade attack to take a prize card! It was a good example of how the versatility of this deck can lead to victory. Really good deck. Takes a couple of times to get confidence with it, but it’s good. I went 7 W 3 L overall, 3 W 3 L vs meta. I did lose to Gardy, Greninja, and Volc, but they were all hard fought matches that I actually had a shot at winning. Seemed like whenever I didn’t OHKO an opponent with Dark Head, they always flipped heads. There’s also a trick you can use if you don’t have a stadium in play – if you use Goodnight, Babies without the stadium, it locks Darkrai up. However, you can still use Zoroark to Stand In AND if Zoroark has a float stone or DCE attached, he can then retreat and Darkrai is free to pound the opponent’s active for 160. Very good deck, will win you a number of matches. And nobody else has seen this combo – in fact, there hasn’t been a video with Hypno in the TCG on youtube for 6 months. Really great job of seeing synergy there where no one else has seen it.